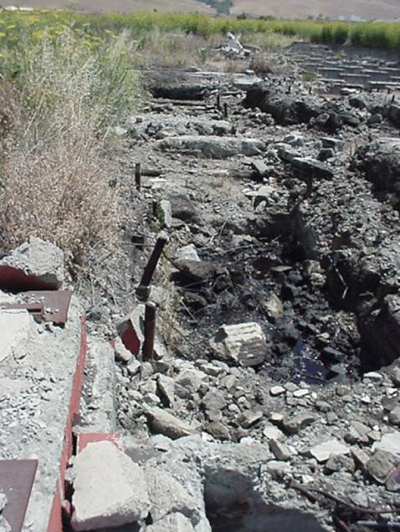 A field sampling program was designed and implemented for a proposed, below grade roadway (State Highway 84) across a former steel company property. The area where the road was planned had concrete building pads; subsurface foundations sumps filled with sludge, slag, and oily liquids and large pipes; and above-ground slag piles and asbestos-containing materials. The field investigation included collecting samples from slag and debris piles and from seven sumps remaining within the right-of-way that contain sludges and liquids. Surface and subsurface soil samples were obtained from 28 geoprobe borings and the boreholes for 4 new monitoring wells. Groundwater grab samples were collected from 19 of the borings. All soil and water samples were analyzed for metals and pH; selected soil and water samples were analyzed for TPH, VOCs, semi-volatile organic compounds and PCBs. Selected soil and waste samples were analyzed for grain size, density, and moisture content. An asbestos survey was conducted to identify and sample asbestos-containing material (ACM) and to determine if ACM was present in the air. Two well clusters were installed, each consisting of a shallow and deep monitoring well and two observation wells. Two aquifer pumping tests were conducted using a shallow and deep pumping well and two observation wells. The four new wells and six nearby existing wells were also sampled for metals, TPH, volatile and semi-volatile organic compounds. The two shallow wells were analyzed for PCBs. Water levels and field parameters such as pH were also measured in all the sampled wells. The hydrology at the site is complex due to the presence of a perched water zone and an underlying partially-confined aquifer used for the regional water supply. Data were used to provide information on possible dewatering options for the roadway. Volumes of hazardous materials were estimated and appropriate disposal options and associated costs were estimated.